The curtain’s up, the lights are pointed at the forested stage. Who’ll lead the line out to the birthday girl’s performance? 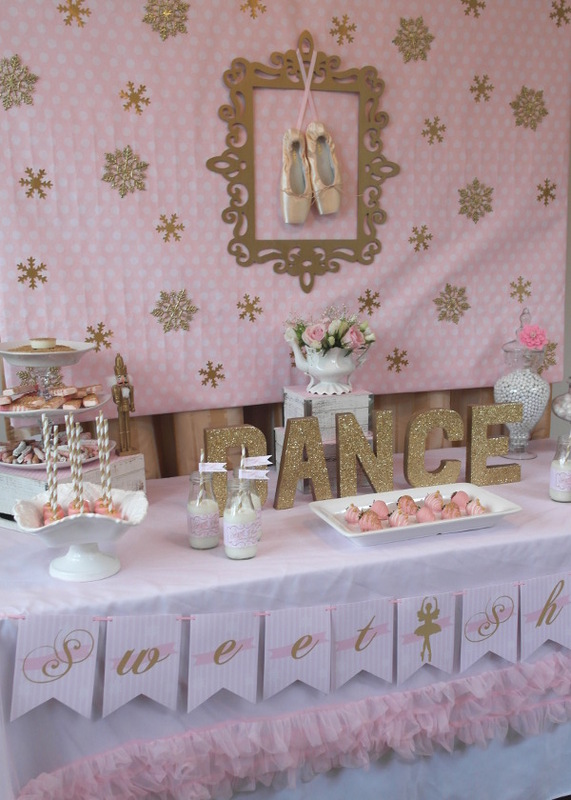 It’s time for a ballerina party! This is going to involve a lot of frills and pinks. For an adorable backdrop, consider a pink cloth with gold-adhered accents. Don’t those hanging toe shoes make that frame perfectly on pointe? But, wait! We’ve taken a grand jeté too far. No curtain may raise upon an empty stage! We need little dancers, and quickly. Put your car into fourth position (drive), and pick up some paper and tulle at Michael’s. Print party details on squares, then attach a top and skirt as pictured. 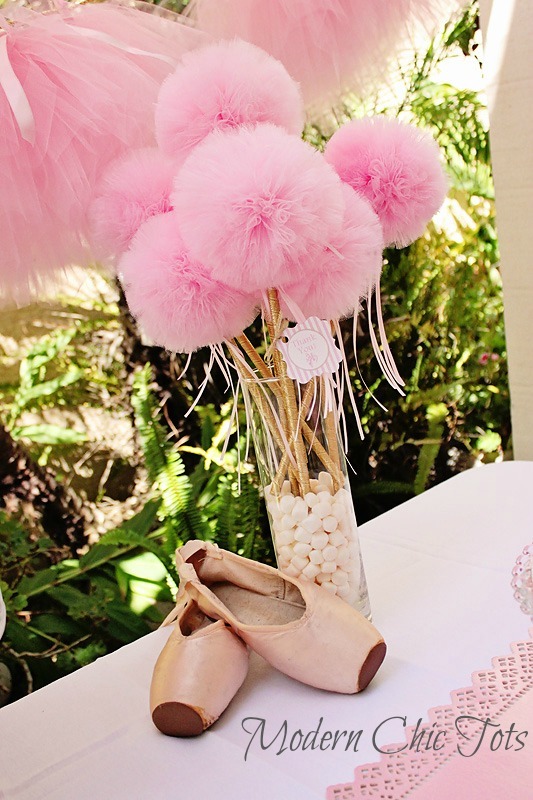 Since you’ve got some spare tulle, consider creating miniature tutus for a preciously pink garland. In fact, buy the place out and hang a few yards down the front of the foods table as well. 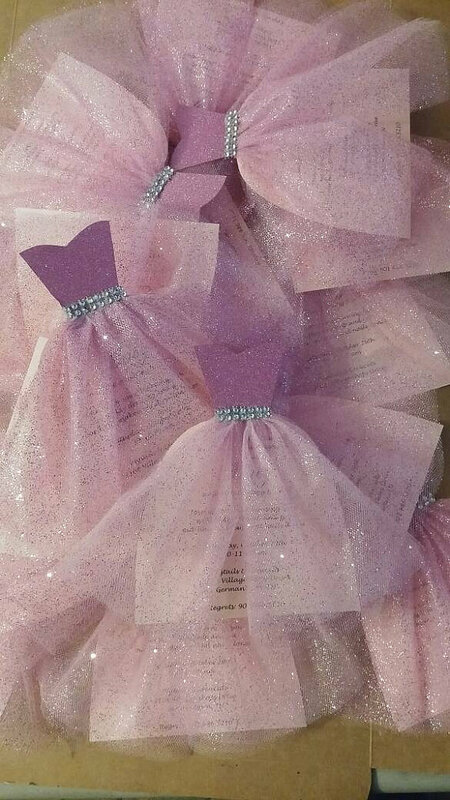 Bestow a tiny tutu on each departing guest for an extra treat, or save them for the next program. Ah, the fluffiness of pink. These wands work as a craft, a centerpiece, or a favor. Scour Dollar Tree for pink loofahs, the hardware store for dowels, and the craft aisles for gold ribbon. You’re just a few glue gun applications away from happy, wand-wielding fairy ballerinas. Wouldn’t some flowers look lovely? Wouldn’t some flowers dressed for the occasion look lovelier? A great performance needs a bouquet, and a great party needs a bouquet centerpiece. 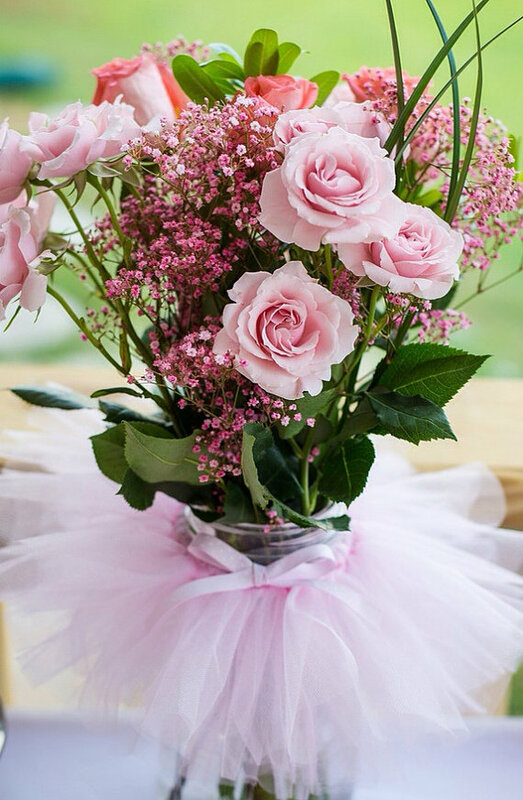 Set a few pink roses and filler in a mason jar, fill with water, and tulle it ’round. The perfect thing about frosting on cupcakes is how well it resembles ruffles. 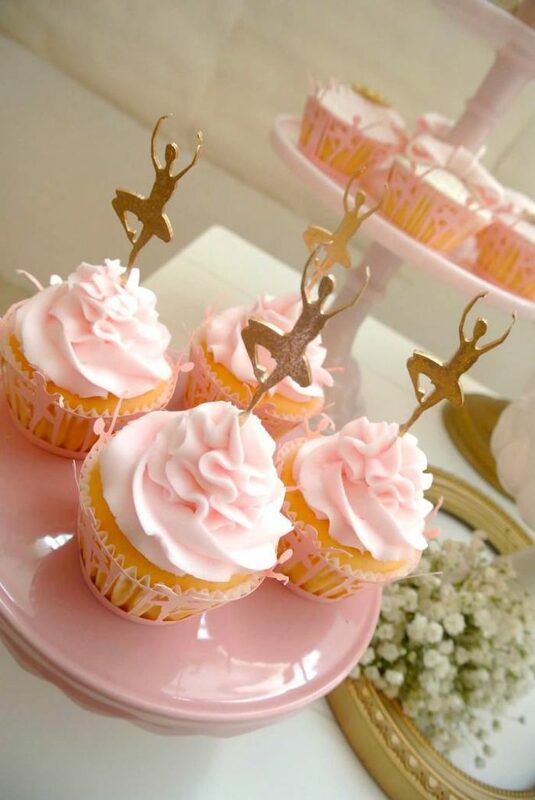 Add to the imagery with a few gold silhouette ballerina cupcake toppers. The guests will take one as they pass, as the tops passé on relevé. 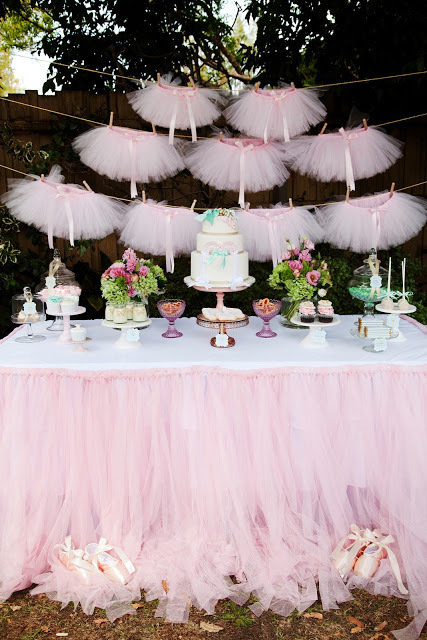 Not surprisingly, there are a lot of cake decoration ideas involving that iconic tutu. Seeing as how I’ve mentioned it in for a few encores now, I thought to include a cake idea with a hint of a tutu. Yes, it’s ruffly. 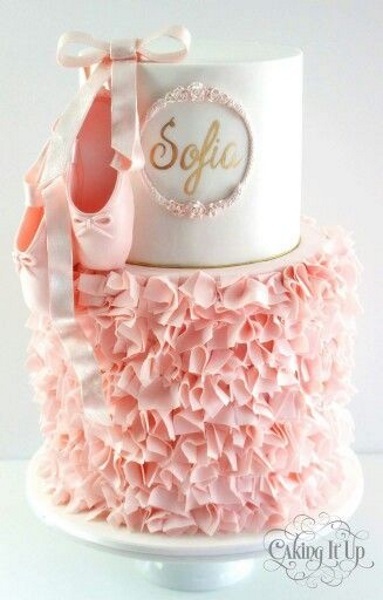 It’s also quite elegant, and “pointes” to ballet with those fondant slippers. Besides cakes and cupcakes, what ballet-appropriate fare shall attendees expect? 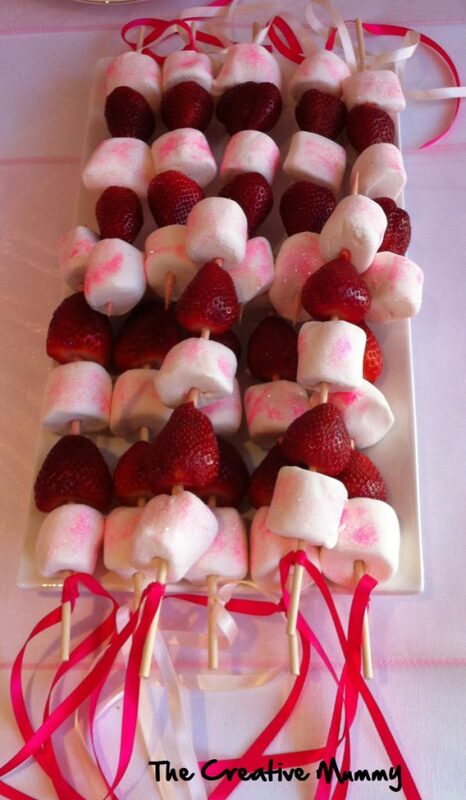 These strawberry and marshmallow kabobs will work wonderfully. Attach ribbons to the ends of each skewer, in your party colors. Pink is the new pink, and we need even more of it for our tiny dancers. 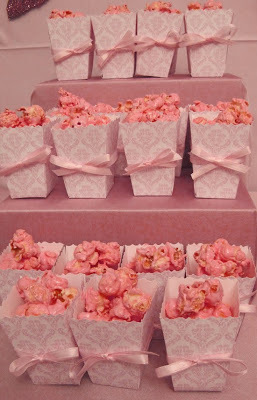 Pop up a batch of plain popcorn; mix with a red-colored, melted sugar and butter mix; and coat the popcorn profusely. Serve cooled, poised, and pliéd in pink cartons. The last refrains of Tchaikovsky die down, the girls finish with attitude, the crowd is on its feet. 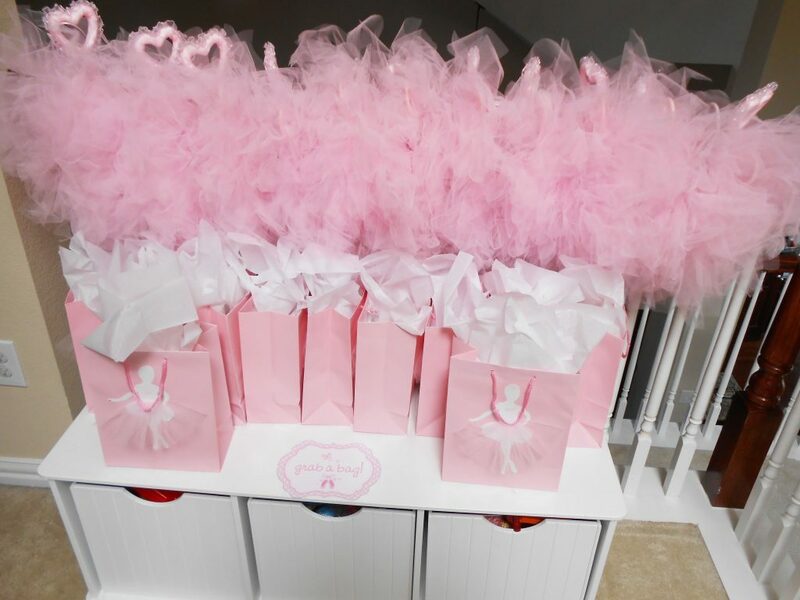 With a final nod to fluffy pinkness, you reach for the goodie bags. This simple idea uses a pink bag with a ballerina sticker, but you could also wrap the treats and prizes in their own tulle. Thank your devoted parents, and take a final bow. You’ve done it, Ballerina Parent.